Playset Assembly is available for $599.00, available at checkout. 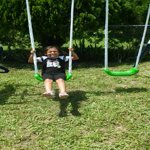 The Sportspower Super 8 Fun Metal Swing Set provides hours of active fun for your family. With 2 swings, a rocking horse and more, this action-packed swing set will undoubtedly become a warm-weather favorite. 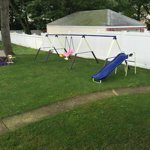 Your family can get exercise and fun simultaneously with the Super 8 Fun Metal Swing Set. 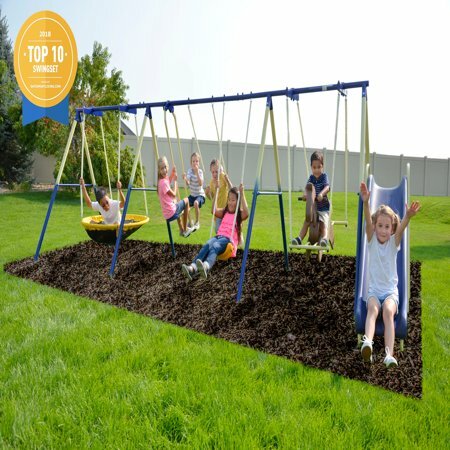 The Super 8 was featured on Safe Smart Living's Top 10 Picks List for Best Swing Sets. proposition 65 reasons:This California Proposition 65 warning is ONLY for residents of California. California Prop 65 Warning: This product contains chemicals known to the state of California to cause malignant neoplasms and/or reproductive toxicity. Do not allow infants to chew on the product as this may lead to exposure. For more information, please contact customer service. After months of looking around for a swing set for our almost 2 year old son (and one on the way! ), we decided on this one for the value, ease of assembly, and amount of activities offered. My son is EXTREMELY active (doesn't sit still even in his sleep!) and I knew the basic swing/slide combos would bore him quickly. We had narrowed it down to this one and one that had a trampoline attached, but I liked this one for the uniqueness of the rocking horse and flying saucer. After checking it out in the store, we went ahead and purchased it, one of the best decisions we ever made!!! It took my husband 4-5 hours to put it together by himself - he said the only part that was problematic was that the slide was a bit of a pain to put together, otherwise it went together pretty easily without any problems (just a little time consuming, but not nearly as much as the wooden sets!) - the person who commented about not tightening bolts until the very end must have not read the instructions too well, because it repeats that step over and over again throughout. Once together, it has provided my son with hours and hours of fun!!!! We replaced one of the swings with a toddler swing, which was really easy to do (you will have to buy separate eye bolts if you do that as the ones they have connected to the swings don't really come off), though we have since discovered that even at 2, he can do pretty well on the other regular swing (I think it helps that it's made of hard plastic - not the bendy kind - and sits decently low to the ground), and he LOVES the rocking horse - he stares out our kitchen window longingly saying "horse! horse! horse!" - it's definately his favorite part of the set! And when he wants to go on the flying saucer, he says "sleep!" because at 23 months, he's small enough that he can lay down and stretch out in it and he thinks it's pretty funny to close his eyes and pretend to sleep (it's kind of like a kiddie hammock for him!). Even the slide, which I was nervous about him being able to get up it himself, he climbs the ladder like an expert with no problems! He's not a big fan of the glider yet, but I think that's still a little too big for him yet. He never comes inside willingly, I always have to plan outside time to come to an end right before a mealtime or some other event and resort to bribery to get him to stop playing for a while! Would 100% recommend this to anyone looking for a great swing set, and you definately can't beat the price for all the fun you get! ...though don't forget to buy an anchor kit if you're not planning on cementing the poles into the ground. Got this one(even larger ones on sale, but NOT this one)because of the horse & the round disc. Have a special needs Grand Daughter & she loves being independent & able to just lay in it!! Plenty of room for 4 or 5 children. My family LOVE this set & use it every day since set up. Happy with this purchase, just wish it had been on sale, as this was a late in the season purchase & almost EVERY OTHER SWING SET was on sale!!! Oh, one more thing...we did "customize" the horse as it has no place for smaller children to hold on or put feet!! A large dowel from Lowe's cut into 2 pieces & hole drilled in head & underside works well. Has a place that looks like it will punch out or a hole was intended, but left off. Have to wonder about that design flaw....but we knew about it thanks to others reviews & had the dowels already(sized to fit the drill)!! 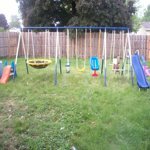 The swingset is great but I couldn't build the whole thing because they didn't send all the hardware to connect the swings so I had to call the company on Monday August 8 and I am now waiting for the pieces. It is a nice swing set. 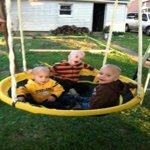 My twins love the saucer because they can sit in it together and the baby liked it because she she can lay and swing. The twins are 22months and able to use the slide by themes self's. The only con my husband and I have is it takes just as long to put the horse together as it does for the rest of the whole set. But the instructions were easy to follow and parts labeled well. With how much the kids live it it was all worth it! I bought this set for my 3 year old granddaughter. I had been looking at many sites at swing sets and this one look to be just right for her with the horse & circle swings. The price was excellent and free shipping. My granddaughter loves it and we have spent many hours playing on it, she can't get enough. I am a retired aircraft mechanic and the assembly took me about 5 hours by myself. It would have been a little easier if you have a helping hand. The directions are very clear and all of the parts and hardware is labeled clearly. I would recommend you use your own tools if you have them. I did not use the tools that come with the set and I am sure this saved some time. There is no spare hardware once you're done, it is an exact count. I did not anchor it in the ground with cement like the directions recommend. I purchased an anchoring kit separate and used that. As a matter of fact if you put it in the ground like it recommends I believe the regular swing would be too low to the ground and you would have to shorten the chains somehow. I ordered this swing set for my 3 year old daughter. The flying saucer and the horse were what sold me! My husband and I were able to assemble both of them in the cool of our house before taking them outside to hang on the frame (very nice). Two things we did not like, however. Some of the bolts that held the horse together stuck out past the plastic holes and are leg scratches waiting to happen. We are going to buy some caps to cover them if possible (not included in the hardware). The last thing we needed to put together was the slide. We found that the factory failed to drill 4 holes in the slide so it could be attached to a cross bar. Thankfully my husband had a drill that could do the job, but it was not a good surprise as this was the last thing to do and the trying to get the drill to come in at a straight angle was very difficult on two of the holes. Other than the horse bolts and the lack of some of the holes on the slide it is a great set and one that will be used for years. I love the swingset but I was very unhappy with a few things. The slide had 2 dents at the bottom and some of the holes for screws did not line up makeing it impossible to put some of the pieces together. My husband had to modify it just to be able to assemble it. My family was beyond thrilled to finally purchase a swingset. After doing my research, I decided this would be the best option for our family members. The instructions clearly stated it would take approximately 2 1/2 hours to complete the assembly, being very capable carpenters - we thought that this would be no problem... boy we're we be disappointed. A large number of pieces did not have the proper hole ailment which would not allow our screws and bolts to be assembled. One of saucer chains was not threaded (which does not allow it to be assembled). 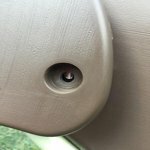 The screws for the slide are way to short, not even long enough to go through the connecting pieces, let alone put a nut on the end to secure it in place. There were so many issues with assembly that it took us 7hours to do our best to correct issues and complete it!!!! What a disappointment. The entire day was gone and the kids had maybe 20 minutes to play on a particularly assembled play set. I now have to contact the manufacturer. Hi MOM1, I am very sorry to hear that. We are always looking at improving our products so I thank you for your comment. I hope you were able to contact our customer service at 866-370-2131 from 9-5 East Coast time. If you need anything else, please email me at customerservice&#64;natusinc.com and I can help you with any questions you may have.